FukushimaVoice: Do you really believe this flyer from Fukushima? People in Fukushima seem to be subject to different standards then the rest of the country. 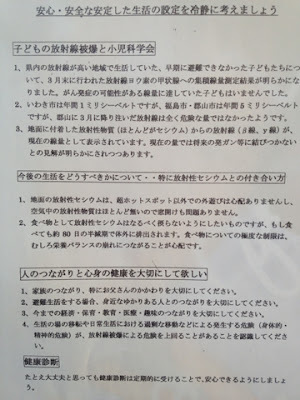 Do you really believe this flyer from Fukushima? People in Fukushima seem to be subject to different standards then the rest of the country. This is a translation of a flyer that was recently distributed to people living in Fukushima prefecture.Apparently it is intended to convince people about the safety of Fukushima to prevent exodus. It’s not a duty of parents to escape from Fukushima. Let’s calmly think about how to establish a stable life filled with a peace of mind and safety. 1. We have the results of cumulative dose measurements of radioactive iodine, carried out in late March, 2011, in thyroid gland of children living in high radiation areas who were unable to evacuate early. No child had reached a dose that can potentially cause thyroid cancer. 2. Annual radiation exposure is 1 mSv in Iwaki City and 5 mSv in Fukushima City and Kooriyama City. The radiation fallout in Kooriyama City in March did not seem to be a dangerous amount at all. 3. Current radiation levels show radioactive rays (beta and gamma) from radioactive material (mostly cesium) on the ground. It is becoming more obvious that the current levels would not cause issues such as cancer in the future. How to conduct a daily life from now on: especially in dealing with radioactive cesium. 1. Radioactive cesium on the ground should not be a concern for children playing outside unless they are in super-hot spots. Since there is hardly any radioactive material in the air, there should be no problem opening windows. 2. It will be better not to ingest radioactive cesium from food, but even if ingested cesium will be excreted from the body with about 80 days of half-life. Extreme limitation of food is more worrisome in terms of causing the nutritional imbalance. Please value your relationships with people and health of your body and mind. 1. Please value your relationships with your family, especially your father. 2. During evacuation, please value your relationships with those close to and related to you. 3. Please value your relationships with those you know through economy, child-rearing, education, and hobby. 4. Please recognize that dangers (physical and mental) caused by relocation and excessive moves during daily lives could surpass dangers of radiation exposure. Even if you think you are okay, it is better to have regular check-ups for a peace of mind. This brochure is a dangerous and prime example to the levels of deception that the governments, owned by the nuclear industrial complex, are willing to engage in to fool the public. Don't you believe one word of this garbage, because that is what this is, pure, unadulterated, radioactive TRASH! Lives will be lost to preserve the nuclear agenda! Do not let this enemy succeed! Check all facts though other sources to verify if you are or are not being told the truth. This brochure is not even fit for toilets!!! Copyright © 2011 Fukushima radioactive contamination symptoms research, All Rights Reserved.. Simple theme. Powered by Blogger.